The ubiquitous question mark is disturbing for its implication of uncertainty. One need only hear Molly Wei testifying in the Rutgers University invasion of privacy case for proof. This serious, well-groomed and coached witness, ends every sentence with a question mark. Hopefully the jurors all have teenage girls at home. There is nothing new about women (of any age) altering their voice for effect. We can all think of at least a dozen performers or celebrities who have adopted breathy/baby voices. Performers do that. It’s what’s called performing. But when a sales associate? or account manager? ends every sentence with a question mark? It’s about something else. A delayed adolescence and all the insecurities that accompany it are on full (somewhat cringe inducing) display. Walk through a large office and note the identical manicures, outfits, handbags, sunglasses, tech toys. It’s like walking through a high school. There was a time when being old enough to work meant being old enough to have an identity. While I admit (very begrudgingly) that television shows are not exactly the same as social anthropology, it is interesting to note the WJM newsroom. 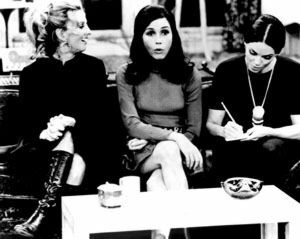 Even if you were from Mars, you would never confuse Mary with a visiting Rhoda or Phyllis. They all had a distinct style and sound. (Sue Ann Nivens was her own best creation, but was a bit older than the other women.) Was there ever a better voice manipulator than Mary? Whether she was “Rob”ing or “Mr.Grant”ing you would never confuse her with anyone else. Isn’t that the point? Whether it’s habit, insecurity, or immaturity, it’s time to stop. See all those strings/rubber bracelets on your wrist? Snap one every time you hear your voice go up. I promise you, in just a matter or weeks you will lose the tic and before you know it; find you voice.